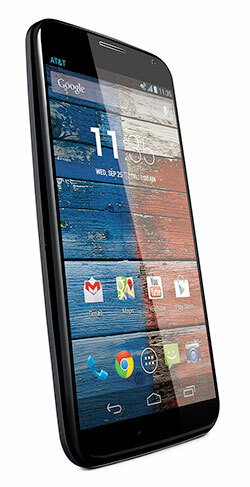 Motorola has just announced the Moto X. The first Android phone developed since being bought out by Google. It's an interesting departure from the business class Droids that shows Google's influence in design and audience. Leaks about the Moto-X have been apearing for awhile. Little leaks here and there, and then what seemed a torrent of information spilling the beans on most of the device features. Still the tech press expected more. They hoped for one last big reveal and were sadly disappointed. The only new information was that the ability to customize your phone will be exclusive to AT&T for a period of time. Instead of the most amazing thing ever we got a mid-range specs, with a lot of custom colors, and some new features designed to sell a lot of phones. The stand out specs do so not because they are high and amazing, but because they are mild and boring. A 720p resolution on a 4.7" screen is not cutting edge, and surprising to see on a flagship device. Especially when Samsung and HTC have had 1080p devices on the market for months. Spec-wise the Moto X just doesn't stand up to the competition. Moto Maker is Motorola's new tool for customizing the look of the Moto X. You can chose from two face colors, 18 back colors, seven accent colors, and (coming soon) four backs made from real wood. In addition to also being able to customize the wallpaper and headphone color. And finally you can write a custom message that is engraved on the back. The possible combinations are huge. Motorola is betting big on people wanting to customize their phone. And why shouldn't they. It used to that people customized their phones with custom faceplaces. Before smartphones Nokia devices had changeable front and back plastic plates that could easily be swapped out. Little kiosks popped up in the malls that sold nothing but faceplates in all manor of styles and designs. Now the Moto-X is a little different. Once you create your design you can't change it. The back is fused to the phone. I imagine to keep the phone thin and easy to hold. But the sentiment is the same. Let people customize their phone and they will enjoy it more as it's unique and special and they helped. Motorola introduced a couple new features with the Moto X that feel very Google. Instead of a notification LED the Moto X shows icons on screen when in sleep mode. You can then drag the icon to unlock into that app to see the notification. It doesn't take a lot battery power as it's only lighting a small part of the AMOLED display. There is also the always on voice command waiting for you to say `OK Google Now` before it launches into action. This is similar to the `OK Glass` on Google's glass device. These customizations feel very Google. They are simple in action and design. They extend existing features in ways that help people interact with their phone, and in a less cumbersome way. Which gets them using their phone more. Google makes most of it's money from advertising. It's goal with Android is to keep people using it's services and to keep searching. To that end phone features that get people using the phone more, using Google's search more, will only help Google. I imagine that we'll see some, if not most, of the new features make it to future incarnations of Android. Or maybe specific Google Apps. But not after Motorola has them as an exclusive for enough time to sell more phones. Beyond the hype, the colors and the features the Moto-X is just another android phone. It's neat and new but nothing like the hype machine wanted. It's important to remember that the tech press is not the intended audience for this phone. The general public is. Soccer moms who keep their phone for years and years, men and children who couldn't tell the difference between screen density and have never swapped out a battery. It's not made for the power user or road warrior. It's made for the everyman who just wants a phone. To that end Motorola has done well. They have a good phone with nice features that users can make their own.